Reviewed from a 12 oz bottle bought in Northern VA.
L - Burnished gold to light amber in color, crystal clear. Dense, rocky, persistent head is off-white. A gorgeous beer. S - Fresh aromatic hops impression: herbal, lightly citrus and lightly tropical. Underneath the hops there are strong malt aromas of bread and biscuit. T - Well-balanced flavors between malt and hops, with the emphasis maybe just slightly onto malt. The malt is bready and sweet. The hops are an equal blend of tropical, citrus and herbal flavors. F - Medium body verging on heavy. Creamy, moderate carbonation. Medium to strong hops bitterness. Deceptively light alcohol presence. O - This is fresh-tasting DIPA that leans a bit more toward the malt balance than most. I'm OK with that. Pours a darkish amber, big billowy head. Big caramel malt aroma. Sweet with a big malt body, this almost seems like a throwback. I used to love this type of IPA. Now I prefer the lighter bodied, happier east coast IPA's. But I still appreciate this type of beer and love it. They last a lot longer too. This one is 2 years old and tastes great! 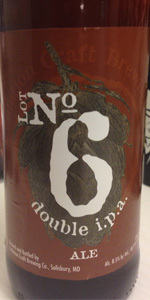 Evolution Craft Brewing Company "Lot No 6 double i.p.a." Notes via stream of consciousness: It's poured a cloudy orange body beneath a finger-thick head of creamy off-white foam. I guess that's OK, cloudy or hazy beers are "in" at the moment. The aroma is quite floral and malty sweet, but also a bit piney and earthy, which is unusual and interesting. The flavor brings in some nice fruitiness that's like apricot and apple and soft citrus, and some golden and medium caramel flavor in its biscuity malt base. Again, that's fairly unusual these days, so kudos to them for doing something different. It's clean, sweetly malty but balanced by a firm bitterness, and mostly dry in the finish with some earthiness, hop resin, delicate pine and residual almost honey-like malt lingering pleasantly. At this point the head has dropped to a partial, very thin surface covering and wide creamy collar but the lacing is quite nice. Except for the cloudiness it would score really well. In the mouth it's medium-full in body and delicately bristling and then creamy smooth with a moderate to median carbonation that seems natural. The alcohol never really shows other than a light wash in the finish although you can sense that it's there and that it's got some strength to it. Overall I'm impressed. This is probably the best beer I've had from Evolution Brewing. It's really nicely balanced, and quite unique. It's a great beer to sit down and relax with, and with spring upon us and summer coming soon I think I'll pick some of this up as an after-dinner porch beer. On the other hand, I think it would pair really well with some smoked chicken or beef fresh off the grill so maybe I'll try that as well. Certainly worth checking out! Poured from a 12oz bottle into a Trillium IPA glass. Look is a slightly hazy amber with an off white head. Aroma is resin hops and sweet molasses malt. Definitely an old school double ipa with a lot of malt and an intense bitter resin flavor. Overall, a great beer. I love the taste and flow. Drinking at the brewery now, I'm impressed by the scale of their operations. Lot 6 is a friend, a friend that will always be there for you.